To enter, please leave a comment sharing your favorite treat to have along with tea (add a link to a recipe if you want to share it!) before midnight (EDT) on May 31. I'll pick a comment at random on June 1 and announce it on the blog, so check back to see if you are the winner! If I don't hear from the winner by June 2, I'll pick an alternate. Thanks for visiting and good luck! ETA: Comments are now closed. Thank you for visiting! I am a huge fan of all things Tea. With a bold, strong black tea like Assam, I prefer savory snacks like sandwiches or crackers. Chai begs for a light, crisp almond or chocolate biscotti. I do not care much for herbal teas, but love flavored black, white and red teas. I love tea. I guess my favorite treat would be a piece of pumpkin bread. Great giveaway too my fingers are crossed. bagels with cream cheese and tea. I love having scones with tea. I live in France, and having good scones is not that common ! Thank you for the giveaway! Please include me in the drawing. My favorite teatime treat is cream cheese & crackers. Great giveaway. I like buttery scones but no tea -- just hot water and lemon, I'm weird like that. I love shortbread cookies with chai. plus, shortbread have so few ingredients and are super easy to make. cute patterns! i am really into lemon bars right now. i love the ones in the kraft magazine with cream cheese in them. How fun! That would be a nice little project. I would have to say that any little homebaked cookie along side some herbal tea is my favorite. Although I don't like herbal teas! Oh, I LOVE this pattern!!!! My favorite treat with tea would be cupcakes! I make different ones depending on the day! I sometimes post recipes on my blog for them. I love cookies. My favorites are Le Petit Ecolier cookies in Dark Chocolate! My favorite thing with tea? A pumpkin/chocolate chip muffin. Thanks for the giveaway! You can reach me at http://kitknitty.com. I love a strong black tea (no milk or sugar) paired with anything sweet! I used to embroider tea towels with my Gramma. What wonderful memories that brings back. My favorite thing to have with tea are actually her little lemon cookies. I use her original recipe still! For sure cookies with tea-or scones or anything with chocolate! I love biscotti! Or some other bread. My tea time treat would be Cat Cookies from Trader Joe's. Not fancy but they're satisfying! My favorite treat to have with tea is a scone. I have made a few different kinds, but I think my favorite is apricot white chocolate! Raspberry scones are also delicious! Oh lovely! I love chocolate with my tea. Cute designs! I love scones with clotted cream (cream tea) when we are in England visiting my in-laws. i've been wanting to learn to embroider, and this would give me just the incentive that i need! i drink a cup of cranberry pomengranate green tea every morning, i like pretty much any tea just fine by itself, but adding some type of sweet never hurts! OMG. I think this is the best giveaway I've come to! I love embroidery floss/original patterns. And that pattern is so great!!! please please please pick me. Scones with tea of course. great giveaway-thanks for your generosity. I love cherry scones with lemon curd to go with my english breakfast tea! I love scones to go with my tea! What a great idea! I like the project kits because they get me all set up so I can get started right away. This is such an exciting giveaway. I was just thinking of restarting my embroidery hobby! Tea on its own is excellent,but to make it truly tea time nothing will do but to have fresh made clotted cream, scones and homemade strawberry jam. Note that continual teatimes of this nature will lead to at least 5 more lbs within a week..
Ritz crackers or a Finnish coffee bread called pulla. It has cardamom in it and it is delicious. Favorite thing to have with tea... lemon pound cake. Yummy! It's so hard to choose, I so like sweets. I like biscotti or pumpkin bread with my tea. Thanks for the opportunity to win your embroidery thread. This is wonderful! I've been wanting to teach myself to embroider but needed some floss to get going. My favorite treat is anything homemade with love. :) It helps if it has chocolate and/or pecans in it. The thing I like to enjoy with my chai tea is a sugar cookie. I'm afraid mine's a bit boring - toast with honey. I love those tea towels! Years ago, when I was 4 1/2, my grandma taught me my first embroidery stitches by drawing around the top of a glass three times overlapping (like a shortened version of the Olympic rings:) onto one of her dishtowels. Years later, I still love embroidery the best though I've learned many other fiber skills since. Okay, so its a bit boring, but I love just a simple shortbread with my tea. I have however been drinking a new tea with caramel in it, and is a treat in itself! I am new to embroidery, but this looks great. My favourite treat is a piece of shortbread, or a bit of dark chocolate. Mmmmm. I just made pudding cookies last week. and it sooo tasty!! it so good with hot tea. My favorite tea treat is Nilla Wafers! I actually don't drink tea...so my best guess is crumpets? I love this giveaway and would love putting a homey touch in my kitchen! thanks! I love Chinese teas, so I think dumplings would actually be my favorite snack! Such a cute towel and a lovely giveaway! I love, love iced tea and frankly, pretty much anything goes wit that! But my current favorite are salted white chocolate oatmeal cookies. Now, I know, that sounds gross kind of and I don't even like white chocolate but seriously, give it a try! It's got to be chocolate biscuits or scones! I like tea, but not usually with a snack, as i drink it to unwind at bedtime. I like cookies and coffee though! Thanks for the chance! I love embroidery! Cross stitch is my forte. My Dutch grandma used to make these butter sugar cookies that we would have with tea. When I was a kid, we always had milk in our tea, but I like it with just a spoon of sugar now. And I can't drink green tea, it's like a weak imitation. Must be black. Hob Nobs are where it's at for tea! Choco Bikkies FTW!!!!! p.s. embroidering rocks my socks!! I prefer iced tea, so for me that goes with summer food- berries, cookouts, fresh corn on the cob! Mmmm! I don't drink tea but I love cookies with milk! My grandma's carrot cake, but it's a heavily guarded secret. I only wish I had it. She doesn't even let anyone in the kitchen when she bakes it. I don't have it often, but I crave/dream about/love lemon squares - nice and tangy with a shortbreaad crust - perfect. My favourite tea accompaniment would have to be cucumber sandwiches, especially when Aunt Augusta is coming round. Mmm of course banana bread! Mmmmm... I love tea! I like iced tea with choc chip oatmeal cookies! Oh I love a scone with jam as a treat with tea. I really like the mix from Stonewall Kitchen. I love the colors you picked for the embroidery pattern! Mmmm, tea and Jam Drops. Yum! thanks for particpating in the giveaway! I love scones that are freshly made with tea. Or monkey bread. Things with sugar! I just got into embroidery! When I drink tea, which isn't that often, I usually just drink it alone. I make it when I'm super stressed out. But I put a lot of honey in it as my sweetner. Thank you for this giveaway! Oh my gosh it is soooo cute. I *love* my tea! I usually just savor my cups of tea alone...the tea brings me joy! :) I often drink Japanese and Chinese teas and love them as my after dinner treat. Thanks so much again! I would love to win this! I love little butter cookies. THanks for the giveaway! i would be so happy to have a chance!! !many thanks for this beautiful giveaway! lemon cookies. I don't have a recipe, I just like them a lot. I love your giveaway! I like to have a little tea cake that my sister makes with her son. We call it the Ben cake because he always asked to make it. My friend's mom had a tea room when I was a teenager and she made these great cucumber sandwiches... I think that would be my favorite. Cream tea of course! Scones and devonshire cream ... yum! Without a doubt, gingerbread goes great with tea...in fact, I had that last night! tea and gingersnaps! I've never done embroidery, and would love to try. With tea, scones with devonshire cream or fruit tarts. Of course I love cucumber sandwiches too. And mini eclairs! No calories at my teas of course! I love biscotti with a cup of tea! Chocolate anything from cookie to cake! You can contact me via a comment on my blog or the email provided there. French-style macarons, whenever I can find them (check www.laduree.com). I have a real soft spot for tea themed things, your embroideries are lovely! I've recently gone back to embroidery so this is perfect. Favourite thing to have with tea? A biscuit, for dunking of course. That is British biscuits, not cookies. I've rarely met a biscuit I didn't like, but have a weakness for shortbread (I am Scottish) or ginger nuts. yum. Thanks for the great giveaway; I love the fact that you're including your own pattern! Lovely! Tea with scones, raspberry jam and cream (clotted if possible). Or shortbread. Or digestives. Or croissants. Help, I'm hungry now! What a beautiful giveaway you've put together, and thanks for entering mine! I love a good scone, preferably one with currants or dried cherries and good clotted cream. Mmmmm. Thanks for a great giveaway! I love tea with anything chocolate, could be a cookie or just a nice dark chocolate square. Lovely patterns. My daughter and I like scones and lemon curd or shortbread cookies with our tea. Great giveaway! Thanks for offering it. Thanks for stopping by my May Giveaway! With tea I like a Pecan Sandie or shortbread cookie! I love tea, with scones! I don't drink tea, but my favorite snack is ice cream. It's so good, I'm sure it would go quite well with tea. 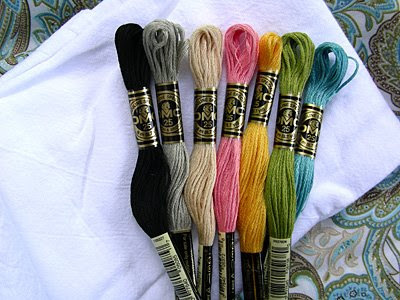 =) I'm just getting into embroidery, so I'd love this prize! Tea, preferably black tea, with cookies or graham crackers--yum. i love green tea paired with a couple of chocolate chip cookies, nothing fancy. thanks for the chance to win! That sounds like fun!!! Thank you for doing this!!! I love to have a good scone with tea. I don't have a recipe. I have never really made one!!! But they are great when I go to tea with my buddies!!! P.S. I've forgotten to say my fave treat with tea is banana bread!! Thanks for joining my giveaway! SCONES! I love good scones with tea! Thanks for the giveaway. I've always wanted to try hand embroidery. I like to sneak into the kitchen and grab a treat that my daughter made. Love tea - both hot and cold. Raspberry is my current favorite with a piece of dark chocolate on the side :-). Thanks for doing the giveaway! My favourite thing to have along with tea are Chelsea Buns. I made them from scratch using this recipe: http://allrecipes.com/Recipe/Chelsea-Buns/Detail.aspx and they are perfect and oh so nummy! my favorite treat with tea is... more tea! ;p actually, it's really good (and by good, i mean buttery!) shortbread cookies. i only wish i had an amazing recipe for them (i always end up buying mine from local craftfairs.) ...on second thought, maybe it's a good thing i don't have such a recipe! I just started embroidery again after many many years. Don't know why I waited so long. Thanks for the lovely giveaway. My favourite treat would be Lemon Cake. I am happy to share the recipe with you but I do not have a link. Please email me and I will send it to you. I'm more likely to drink coffee than tea, and something chocolate is what I often crave. I don't get around to tea too often, but when I do, I love to share it with some homemade banana bread. ♥ i love 'high tea' with little crustless sandwiches! hey, you should try your luck at my giveaway too! I don't drink tea!! But I love cookies with milk. Can that count?! My favourite treat to have with tea are the most delicious chocolate biscuits in the world - Tim Tams! If I win, I will send you some Tim Tams so you too can appreciate these delicious naughty snacks with your tea! What cute patterns ! For me anything works with tea, but sandwiches and french fries are my faves. maybe with some fruit in it. When I was working in a coffee (and tea) shop, I had a pretty bad rugelach habit, but I've convinced myself it would be too hard to make at home, which does help keep my weight in the reasonable range, I think. If I'm having sweet iced tea (as we southerners do) I love cheese-its! If it's hot tea, I prefer to drink it black and by itself! Oh, definitely Carr's ginger lemon creme cookies. Thank you, Trader Joes. My favorite thing to have with a cup of Good Earl Grey Tea... would have to be my mother-in-law to be's Biscotti. I am not quite sure of the recipe but it she uses Walnuts and a touch of Anise. The best part is (to me at least) she doesn't double bake it, so it isn't quite so hard. I like animal crackers..lol I am such a child, I know! I love Earl Grey tea and chocolate. Yum. Definetly the biscotti you can buy at Costco. They are just delicious. Great give away. Thanks for the chance to win. I love clotted cream and scones. Mint tea, summer or winter and ice cream, summer or winter. I think I'm going to win! madeleine cookies are the best. so buttery and soft. My family is dutch-indonesian, and there are these Dutch cinnamon-spice cookies (windmill spice cookies) that my mom gets. They go great with a hot cup of tea on a rainy day. I love Oreos with tea...I know it's a bit odd, but they get soft and gooey when you dunk them and the tea follows well! I've just taken up embroidery and love this giveaway! This is an AAAdorable give-away; many thanks for your kindness. I've started embroidering tea towels, napkins and the like...great past time with something productive to show for my efforts! I like any kind of tea, never met one I didn't like. I love the tea time tea towels. Your patterns are so cute. THanks for hosting a give-a-way. chocolate crunch slice, and I haven't had any in AGES - but yum! Please enter me in the draw and don't forget to enter mine! i love a good book in one hand, and my tea in another. i love drinking tea! i usually have it alone or with breakfast. i bet it's nice to have with a beard papa cream puff! I love to have a croissant with tea! I would love to win this lovely set! It has to be a fresh made biscuit with honey and butter. Thanks for participating in the giveaway day! I love having raisin and oatmeal biscuits with my tea! Lovely giveaWAY! This is a great giveaway! I love your blog. Your roses are so pretty! I really like how you put the marbles and buttons in jars. So creative. I have a lot of buttons, if I can only find them after our move! I want to display them like you did! I like to drink hot chocolate instead of tea and my favorite treat with it is toast with cinammon sugar. Lots of sweetness, I know! Thanks for participating in the giveaway ! I LOVE TEA! My favorite thing with tea is either a good book or good friends! As the spoon says... yum!! tea and chocolate chips :) no recipe needed! I love to have fresh baked bread and jam with my tea. I like brownies with my tea. Cool giveaway. My favourite treat is when I make soft sticky brownies - although I have them with coffee not tea, as I don't drink tea! My favorite treat with a cup of tea would have to be cheese bars. They are soooo good! Scones, of course, with clotted cream. So sweet... I have to go with McVitie's Digestives as perfect tea accompaniment...not too sweet or heavy. Yummy! Thanks for the giveaway. I need my own set of tea towels, so this would be a great start! Thanks for the great giveaway. One of my favorites is Snickerdoodle cookies. You can find a link to my recipe on my blog: www.thestitchinchicken.com. I am also participating in the giveaway so don't forget to sign up! I'm boring Toast is my favorite! Ah, tea! 1st choice. Scones with clotted cream in a tiny cafe in London. 2nd choice. Goldfish crackers and animal cookies for a tea party with my toddler on the back patio. I would love, love, love to win this! Thanks for the chance! Flour sack towels are the best! My favorite tea companion is scones with lemon curd and Devonshire cream. And I am SO hungry now! I don't have a link for a scone recipe, though! I'm sorry! Scottish shortbread fingers all the way!! Ohhh the buttery goodness!!! I must just pop and have one(or two or three) right now!! Well I don't drink tea very much, just a chai tea occasionally. If I could (without gaining weight so much) I would have cookies with it, ginger snaps or some kind of molasses cookie. Thanks for doing the giveaway! Ooh, favorite treat with tea? That is a tough one, but I do love sugar cookies with almost any flavor. Thanks for asking and for the generous giveaway offer! I love to have Tim-Tams with my tea! sugar cookies warm from the oven and sweet black tea. yum! I'd say any type of muffin... orange spice maybe. Thanks for the giveaway. Mini sandwiches are a favorite with tea. A bit traditional and fun! Thanks for the participating in giveaway day!